ST. LOUIS (AP) — The land of Ernie Els, Retief Goosen, Louis Oosthuizen and Charl Schwartzel could be delivering another major-title winner. 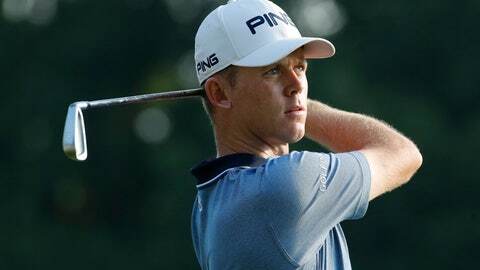 With his second straight solid round at the PGA Championship on Friday, South Africa’s Brandon Stone is one good weekend away from breaking through at the same course where the godfather of golf in his country, Gary Player, completed the career grand slam a generation ago. If carrying that weight feels like a burden, the 25-year-old Stone certainly didn’t show it over a steamy, 4-hour, 38-minute round at Bellerive Country Club — the same place where Player won an 18-hole playoff over Kel Nagle to capture the U.S. Open in 1965. Stone shot 2-under 68 to head into the weekend at 6 under. That put him four behind leader Gary Woodland, and one shot behind Schwartzel, the 2011 Masters champion, who tied a PGA record with a 63. “There will be a lot of happy golf fans back home,” Stone said. Starting on the back nine, Stone made back-to-back birdies on 16 and 17 to briefly pull into second place, one shot back of Woodland. He played his second nine at even par, and though there were lower scores to be had — Brooks Koepka joined Schwartzel in the “63 Club” on a soft, nearly windless morning at Bellerive — Stone likes where he stands. Stone’s switch back to a blade putter has sparked a surge that is keeping him in the headlines this summer. Four weeks ago, he slid an 8-foot putt just outside the cup on the 18th hole in the final round of Scottish Open to come an inch from shooting 59. The win at the Scottish got him a spot in the British Open the next week, and he spent much of the first round near the top of that leaderboard. At the PGA, it’s now two days near the top of the leaderboard, and he insists it is not all that uncomfortable a feeling. “I’m playing really nicely, the rhythm has been spectacular all week,” he said. Stone spent 2013 at University of Texas, where he was named NCAA Freshman of the Year, but then left to turn pro. Stone said using driver a lot is part of his game plan at Bellerive, and it’s helping him. Over two days, he’s averaging 303 yards off the tee — fifth best in the field. Not surprisingly, Stone’s phone has been blowing up. He’s receiving texts from a who’s who of South African sports figures — mostly rugby and cricket players, including one of the country’s best cricketers, AB de Villiers. Before dealing with Sunday, Stone had to navigate his way through Friday night and Saturday morning — he knew it would be a long wait until his next tee time. His plan was to get into some air conditioning, possibly go see “Jurassic World,” which won’t show up in South African theaters for a few more weeks yet.